Lunchtime - pleasantly sunny inside under the glazed roof area. Lunchtime. Very slow service and a fowl pint after the long wait. Whitstable - Winkle Picker 4.50 Vinegar. This should never had made it to a glass. Changed without an apology. Late afternoon - Canterbury is heaving in the unusually hot spring weather - but the pub is surprisingly quiet. Only 4 or 5 ales on - and only one of interest. Whitstable - Single Hop Styrian Wolf 4.40 Very good, lemon zest. Heaving as expected on a Friday evening. Bad practice continues of displaying pump clips for beers that are not available. Only listed the more interesting beers. Evan Evans - Grand Cru St David’s Ale 4.40 Very ordinary beer despite the showy name. Vale of Glamorgan (VOG) - Dakota Red 5.40 Not Tried Disappointingly not on. Pump clip showing with not even a “coming soon” tag. Celebratory pint - halfway through January and my 50p vouchers have arrived making it just £1.69. The barman said that their trade was about 50% up since the Ingoldsby closed - but it was quiet this afternoon. Just noted two of the beers on. Adnams - Broadside 4.70 A warming brew for January. Start of my Xmas shopping - the rules are one pub for every shop - starting here around 1230. Busy and not quite enough bar staff on (no change there then). 4 or 5 other ales on. Mid afternoon - thought I ought to use a voucher and see what was on offer. Only listed the more unusual beers. Burton Bridge - Burton Porter 4.50 A smooth winter warmer to lift the gloomy weather. Came for a night out with the guys I train with. Busy but with a good atmosphere. Late morning for Chai. Fair crowd in. Temperance Union - Vfm Softy 1.00 Getting fed up with lukewarm Chai....health & safety gone mad! Using up my vouchers before the end of March - and at 50p off festival ales that are only £2.15 to start with this feels like being back in the 80s. Only noted those supped. Moorhouse's - Pride of Pendle 4.10 Solid brew. Westerham - Audit Ale 6.20 Barley wine notes - very nice. Whitstable - Winkle Picker 4.50 Disappointing - I like their IPA a lot - but this was very bland. 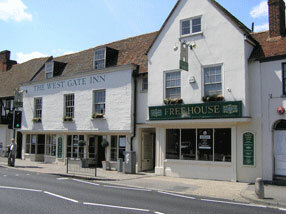 The pub is found in Canterbury, Kent, CT2 7EB. Located just in North Lane. Quite substantial floor space and nooks and crannies to drink in. This Wetherspoon pub takes its name from its proximity to Canterbury's West Gate, one of the finest medieval gateways in Britain. This is a Grade II listed building, and dates from the 17th century. Over the years, it has been modified and rebuilt, and has lost much of its timber frame and original features. We have visited this pub 73 times, seen 151 different beers and tried 83 of them.